This has been ‘one of those weeks.’ You know the kind where your workouts and meals seem like they’re wedged into 30 minute blocks and the rest of life slops out of it’s designated time slots to overtake your day? Yes, it was that week. Thankfully those brief windows of fueling and sweating managed to persist, and I have lived to tell the tale. Next week I will update you on the actual contents of my to-do lists, with big announcements coming out of FemCity Charlottesville. Ah-mazing upcoming events. 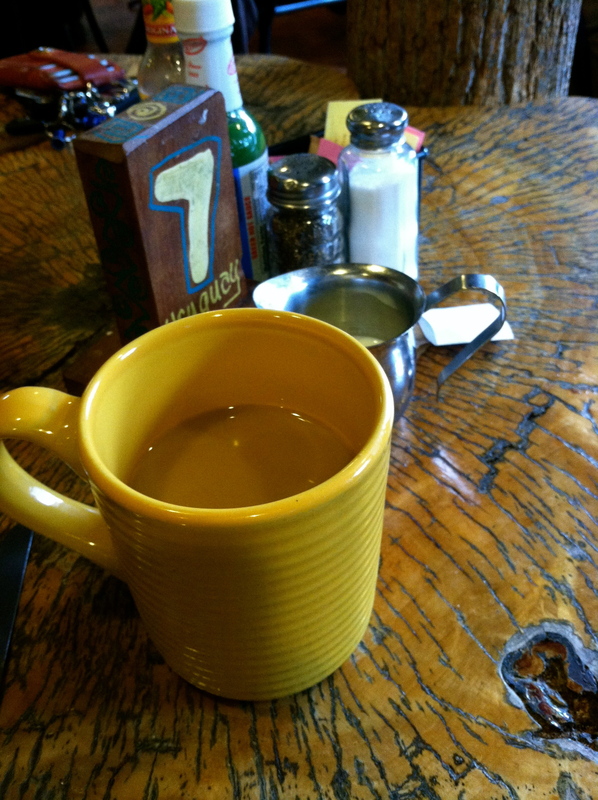 I’ve said it before and I’m sure I’ll say it again, but coffee is the only reason that I’m alive. This is one fact that I’m certain of. One of the hardest things about running around town on a crazy schedule is getting my coffee fix, but also getting some good food into my body to start the day. One of my favorite spots in Charlottesville, LaTaza, has the awesome coffee house community vibe, with great coffee, and great food to back it up. The breakfast menu is awesome in and of itself, but they are also amazing about modifications. I’ve found myself there several times this week for meetings, but Wednesday morning after bootcamp I desperately needed a re-fuel. 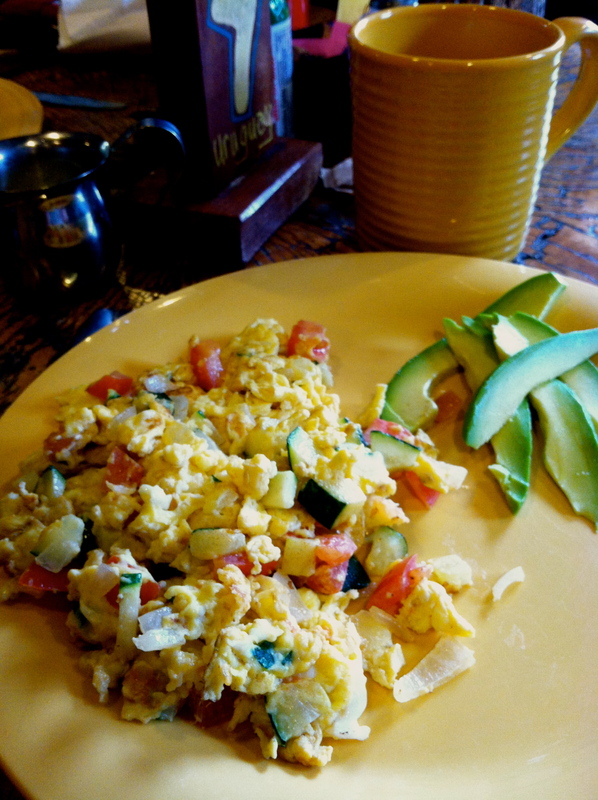 Scrambled eggs with zucchini, tomato and a side of avocado. If that’s not an awesome healthy dine-out breakfast, I don’t know what is. Oh, also, it was delicious. It’s so hard to find a spot that has great coffee and great food, so this was such an amazing find. As I was heading back out into the world, well fed and caffeinated, I caught a glimpse of this flyer for Adam & Katie’s yoga workshop next weekend at Opal Yoga, right here in the heart of Charlottesville. I can not wait for next weekend not only to see those two jokers, but to show them around our beautiful city. Since I know that they’re on the same page when it comes for having locavore hearts and a love for all things farm to table, one of the stops on the docket will undoubtedly be the city market. This way I can fulfill my produce needs for the week, buy my local meat, and see the ever-loving ever-amazing creative soul, Erin McDermott, who will be selling her jewelry there. Quick sidenote: check out this guide from Real Simple on the best spring produce. 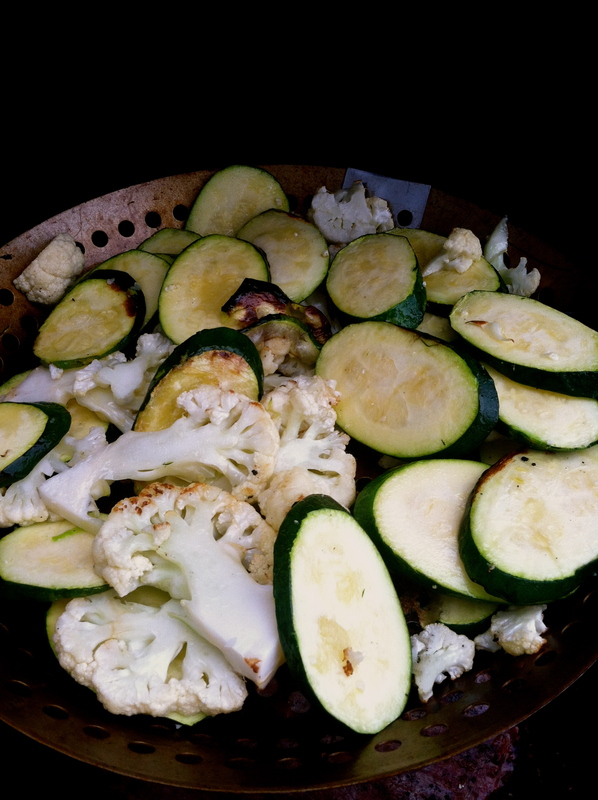 It’s a great one to keep seasonable vegetables in mind, and generate some new fresh meal ideas. 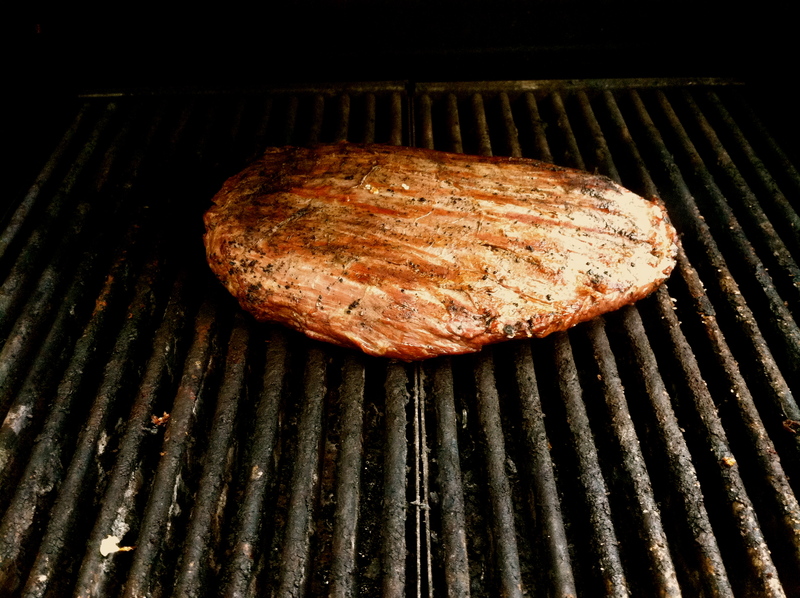 Dinners have been mostly grilled or left over this week, with my personal favorite meal of grilled flank steak and vegetables. When it comes to grilled vegetables, the most commonly grilled for me are usually asparagus, squash, eggplant, and peppers/onions when it’s kabob time, so I wanted to throw in something different. A few weeks ago I had some grilled cauliflower at Zinc that I absolutely loved so I gave it a shot at home. Truly, it was awesome. Cauliflower doesn’t have the same crisping tendency that broccoli does, so it gets nice and tender without the same burning/dry tips. You can lightly brush with olive oil and season with salt (or whatever you want – maybe throw in a little cayenne for a kick) and grill it up. The other upside to grilling a little firmer of a vegetable is that they really hold up well as leftovers to use with other meals, and in the case of this week, in scrambled eggs. Seriously, it was good. My sweat schedule this week consisted almost exclusively of Bootcamp, with one simple quick and dirty run that may have actually been my first run in a few weeks. I’ve been nursing a tight back thanks to some not-so-smart adventuring that I did, so my goal was to keep moving, but take it all in stride. Rest can be a good thing. I’ve hit my limit of work interest for the day, or maybe the week, so I’ve planned a walk into the afternoon and will be shutting down for the rest of the night with a couple productive but social (socially productive work) meetings to kick off the weekend. 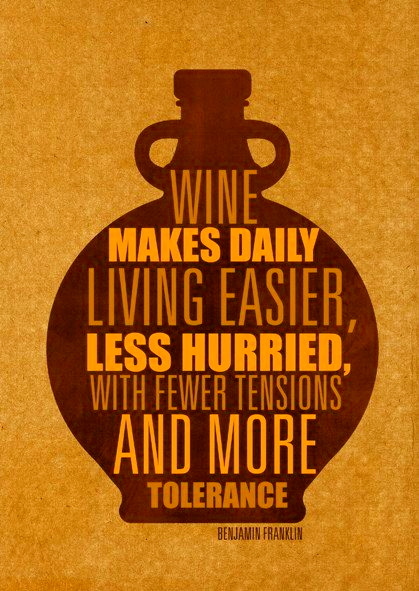 As I always say, ‘when in doubt, wine,’ and that’s exactly what’s on the docket. Until next time, keep it local + cook it clean! 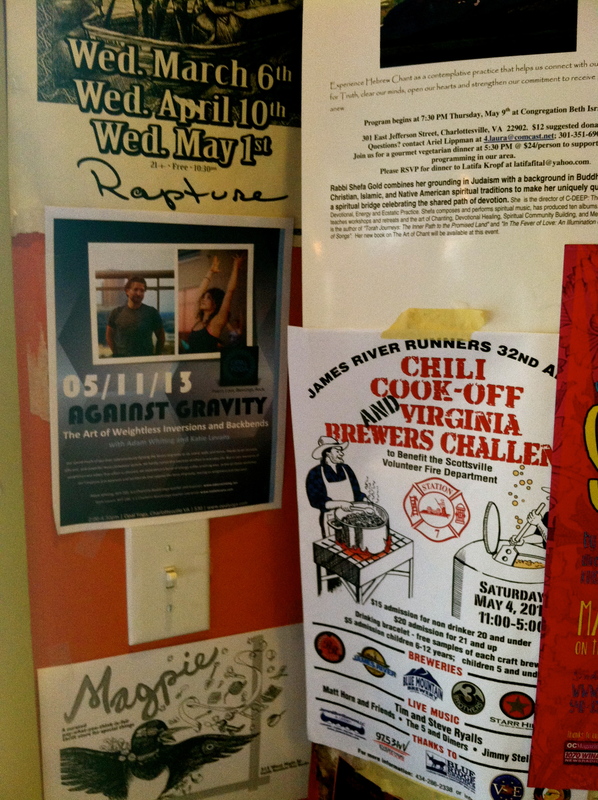 Pingback: Early Spring Weekend: Meals + a Run | fuel. sweat. grow.